For SS12, your sandals should do the talking and make a bold statement in your outfit. Look for glossy, colourful patent (no.1) or flashes of neon (no.2) to inject some colour into your look. Alternatively embrace the futuristic trend with a metallic pair of sandals like this on-trend ASOS pair (no.5.) A fun way to liven up an everyday outfit is with a printed sandal, and no-one does prints better than Marni (no.6). 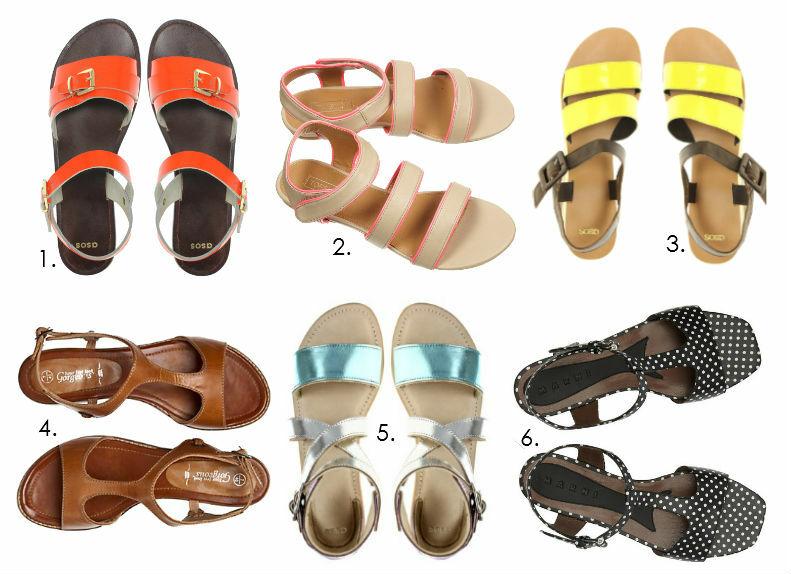 The 'sensible' sandal (no.4) is also a key trend, look for a block heel and real leather to work this look. Finish off with a pedicure and a pop of bright nail varnish and you're good to go! 1. Fearne leather flat sandals, ASOS, £20.00. 2. Highlight patent sandals, Topshop, £28.00. 3. Vinnie flatforms, ASOS, £40.00. 4. Tan leather t-bar sandals, New Look, £24.99. 5. Flipper flat leather sandals, ASOS, £25.00. 6. Polka-dot leather sandals, Net-a-porter.com, £265. Love the bright orange ones! I love them all! You can wear it whatever with! And the prices are great!!! Gold Sandals are also popular today, I wonder why SS12 did not include to have gold sandals on their top 6.